People who have been in accidents or have disabling conditions such as low-back pain, arthritis, heart disease, fractures, head injuries and cerebral palsy turn to physical therapists, commonly called PTs, for help. These health professionals use a variety of techniques, called modalities, to restore function, improve mobility, relieve pain and prevent or limit permanent physical disabilities in their patients. PTs supervise physical therapist assistants and physical therapy aides and, along with them, are members of a team that also includes doctors, occupational therapists, and speech pathologists. PTs earned a median annual salary of $85,400 in 2016. In 2014, they held about 211,000 jobs. Most physical therapists work full-time, but about 20% have part-time positions. Jobs are usually in physical therapy practices or hospitals. 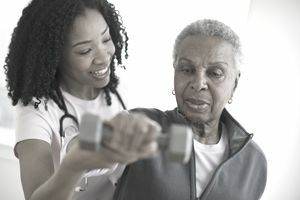 Home health care agencies and nursing and residential care facilities are also frequently employers of PTs. The U.S. Bureau of Labor Statistics has designated this "bright outlook" occupation because of its excellent job outlook. Employment is expected to grow much faster than the average for all occupations through 2024. "Administer direct patient care in accordance with the written, and signed prescription of the referring physician or other State-authorized practitioner." "Create PT treatment plans to improve or restore a patient’s mobility and reduce pain." "Test and measure patient’s strength, range of motion, muscle performance." "Advise and consult with the family, inter-intradisciplinary team members, physicians and other professionals, as appropriate, to ensure optimal patient care." "Document all treatments rendered and maintain appropriate work records." "Continually reassess resource utilization as patient progresses towards goals." "Delegate to physical therapist assistant and physical therapy aide with appropriate level of supervision." To become a physical therapist, you must first graduate from a physical therapist educational program with a Doctor of Physical Therapy (D.P.T.) degree. Expect to take classes in biology, chemistry, and physics, and specialized courses such as biomechanics, neuroanatomy, human growth and development, manifestations of disease, examination techniques, and therapeutic procedures. All states in the country require physical therapists to be licensed. You will have to take the National Physical Therapy Exam which the Federation of State Boards of Physical Therapy (FSBPT) administers. Licensed PTs must take continuing education classes and attend workshops to maintain licensure. Specific requirements vary by state. You can find a list of state licensing authorities on the FSBPT website. Dexterity: The ability to use your hands will allow you to perform manual therapy on your patients. Physical Stamina: As a PT you will have to spend a lot of time on your feet and move around a lot. Not only should you be physically fit, but you must also enjoy physical activity. Compassion: If you don't have a strong desire to help people, this isn't the career for you. You must be compassionate toward your patients, who might be in a lot of pain. Interpersonal Skills: You will have to establish rapport with your patients, read their body language, and convince them to do the exercises you prescribe. Communication Skills: In addition to excellent interpersonal skills, your listening and speaking skills must be superb. They will allow you to understand what your patients tell you and convey relevant information to them. Analytical and Observational Skills: These two skills will enable you to diagnose patients' problems and evaluate the effectiveness of the treatment you administer. Reading Comprehension: You must be able to understand written instructions from physicians and other healthcare professionals. "Ability to converse in a calm, friendly manner." "A willingness to learn, enthusiasm for the profession, and a sense of humor." "Demonstrate strong computer skills with Microsoft Outlook, Word, and Excel, and have experience with electronic documentation." "Demonstrate good attention to detail and timeliness with documentation." "Must be able to work independently with minimal supervision." "Must be capable and willing to perform tasks in a stressful environment." Take this quiz to see if this career is right for you: Should You Become a Physical Therapist? Bureau of Labor Statistics, U.S. Department of Labor, Occupational Outlook Handbook, 2016-17 (visited April 19, 2017). Employment and Training Administration, U.S. Department of Labor, O*NET Online (visited April 19, 2017).